Along the main thoroughfare here, drivers brake for warped asphalt. Houses sink unevenly into the ground. Walls crack and doors stick. Utility poles tilt, sometimes at alarming angles. Above the permafrost in Southwest Alaska, an active layer of soil, often peat, freezes and thaws each year. With air temperatures warming too, the active layer is growing bigger, consuming what had been thought of as permanently frozen. Thirty years ago, crews would hit permafrost within 4 to 6 feet of the surface, Salzburn said. Now they typically find it 8 to 12 feet down. To install piling deep enough into permafrost to support a house, they used to drill down about 18 feet. As permafrost under a structure thaws, strange things happen. Permafrost is laden with ice but it's not uniform and much about it is still unknown, Romanovsky said. Watery voids create instability where ice once held firm. "People can't close their outside door. That's when they call and say, 'Hey, I got a problem,' " Hanson said. The whole house might sink so much that a wastewater line no longer has enough slope. Toilets need repeat flushes in a town where many people ration their home-delivered water. Low spots in pipes become bellies that trap wastewater, then freeze and burst in wintertime. Many homes are built on posts set on wooden pads that act like snowshoes, preventing the structure from sinking into sand or gravel fill. Most need regular leveling, which involves jacking up a house and, at a minimum, adding wood shims under posts to even it out. Between the active freeze-thaw layer and the permafrost, there used to be another section that didn't refreeze each winter. In recent years with little snow, that layer freezes too, heaving what is above. In the heart of Bethel, the Office of Children's Services building shifted last year due to permafrost thaw and freeze. In October, it was leveled, like it had been periodically, but this time the interior was damaged in the process, said Sharon Lechner, president of the company that owned the building, Tunista Inc., a subsidiary of Calista Corp.
After disagreement on what to do, the state lease ended early, she said. In June, the building was demolished. With warming, thawing and refreezing, people involved in Yukon-Kuskokwim Delta construction and maintenance believe more buildings are shifting, and doing so to a greater degree. There's no hard data yet but that may come. 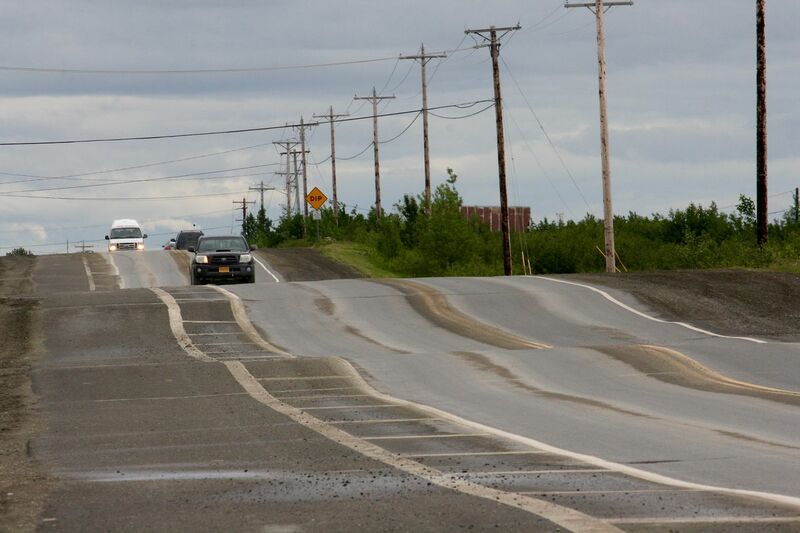 With aging buildings, the root cause of foundation problems can be hard to pinpoint, say officials with Yukon-Kuskokwim Health Corp., the Alaska Native-owned corporation that runs village health clinics along with the hospital in Bethel. YKHC is just starting to track how often its clinics, in leased space, need leveling. The most recent reviews found that 23 of 41 clinics needed at least minor leveling, said Brian Lefferts, YKHC director of environmental health and engineering. Maintenance workers this summer installed warning signs. One near the airport alerts drivers to dips for the next 4 miles. Workers glued down orange markers in sections to better separate the highway from a paved pathway where people walk and bike, Thomas said. Some drivers were veering into the pathway or shoulder to avoid the worst dips. Some of the orange markers already are down. "I just have to watch out," said Quyana Cab driver Dan Kim. "I usually ask the customer if they are OK with a little bump in the road if I fly right through." Kim said he slows down when driving pregnant women who flew in from villages to spend their final month at the YKHC prematernal home. DOT is planning extensive repairs estimated to cost almost $9 million but first must better identify what is causing the heaves, said Aaron Hughes, a transportation department project manager. Officials suspect thawing permafrost. Some of the problem might also stem from culverts that trap air under the roadway and hasten thaw, Hughes said. A project in 1989 added heat-extracting siphons but they no longer appear to be in place, Hughes said. Whether that would be a good solution now is something to investigate further, he said. Some locals remember when the road was gravel and said it was better then. DOT records show that it had pavement of one kind or another since the early 1970s, Hughes said. It's true that a gravel road can be more easily evened out but it also requires more day-to-day maintenance, he said. Plus, gravel is dusty and has to be replenished regularly, said Bethel Mayor Rick Robb.